Tenacious Toys will be splitting a booth at the 2011 New York Comic Con with veteran vinyl toy manufacturer Toy2R! 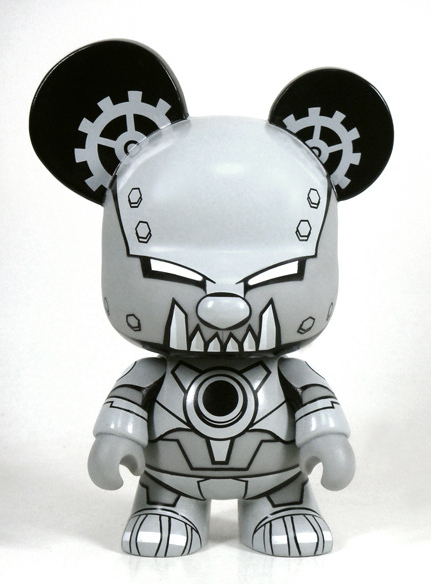 Expect dozens of artists to be hanging around, meet the President of Toy2RUSA, see beautiful Toy2R customs! Buy toys, chop it up with Benny, Steph and Kevin Winnik, meet all the artists you've been following all year long! It's gonna be a lot of fun. We're excited to see all of you again! NEMO's at it again, raiding the Queens 99-cent stores for platforms for his customs. NEMO is the brain behind the Rollie Show, our very first custom show which used 99-cent Avon-brand roll-on deodorant bottles as a platform for the customs. NEMO's a big fan of spending as little as possible on the platform, and using your own creativity to turn a cheap piece of plastic into something beautiful. 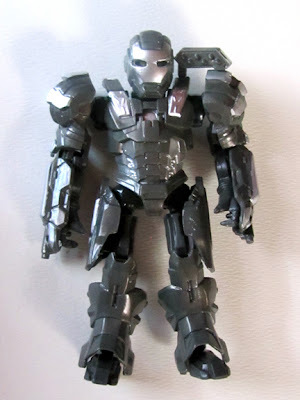 The 99-cent platform NEMO found, called "Steel Warrior"
Not long ago, NEMO stumbled upon a treasure trove of these 5-inch Iron Man bootleg figures called "Steel Warriors". They were priced at 99 cents each, so he bought a case of them. For his first custom on this illicit platform, NEMO chose the Tenacious Toys team colors- white and medium blue- and painted up a weathered, armored, bootleg custom just for us! NEMO says he was surprised at the quality of the toy- it's articulated, the helmet flips up and the armor plates are removable! Not a bad find for 99 cents! 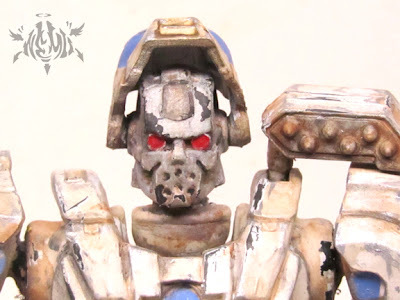 We will be the exclusive retailer of NEMO's Steel Warrior bootleg customs. More to come, stay tuned! For now, you can buy this awesome custom in our shop here for just $45! We haven't had a NEMO piece priced that low in years. If you'd like to meet NEMO and get his autograph, or have him doodle on your toy or in your book, you can meet him at his signing at our NY Comic Con booth! Booth 876, 3PM, Saturday October 15th. NEMO will be signing alongside OsirisOrion and Bob Conge of Plaseebo. 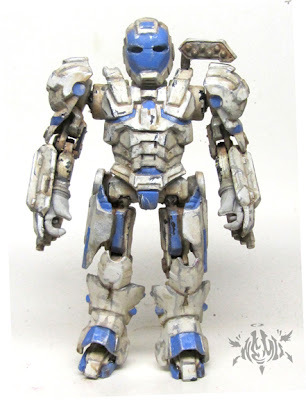 Argonaut Resins Pharaoh Hound: first painted pics! Argonaut Resins has released the first images of painted Pharaoh Hounds: Pearl White and Black Onyx colorways, with matching Tuttz cats. The Hounds are Argonaut's follow-up resin figure to the extremely popular Tuttz figures. Every single Tuttz release sold out immediately; I'd expect nothing less from these beautiful Hounds! Each Pharaoh Hound resin figure is 8 inches tall and is handcrafted and hand painted locally in NJ by Eric Nocella Diaz of Argonaut Resins. Argonaut will be releasing more colorways during the run up to NYCC in mid-October. Eric also spoke of his plan to release a mini version of the Hound after NYCC, much like he did for the Tuttz cats. 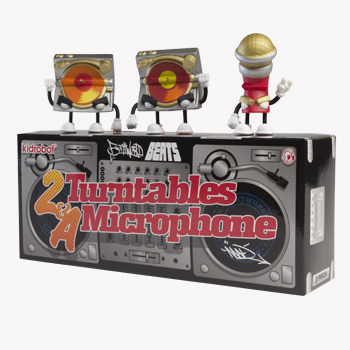 The Two Turntables and a Microphone set, designed by MAD and produced by Kidrobot, is in stock here. Three vinyl mini figures in packaging that looks like a DJ booth! Part of the Bentworld Beats series by Jeremy Madl. Smash Tokyo Toys' own Atomic Beartank 5-inch Mini Qee by Toy2R is now in stock here.